Building resilient infrastructure and applications is more than developers writing good code. Code can be perfectly written but can still be unfit for the greater system – leading to many arguments between siloed development and IT operations teams. Up front, it’s best to establish a DevOps culture where improving workflow transparency and collaboration and tightening the feedback loop between teams can address these issues. But, every good team has a backup plan in place – and purpose-built incident management software helps facilitate these operations. But, no matter how resilient your team and system are, incidents will occur. This is why DevOps, IT and SRE teams everywhere need real-time collaborative incident management software. From end-to-end, incident management software allows your team to detect issues quickly, swarm to the firefight and quickly fix the problem. Instead of moving a ticket through a help desk queue and spending time keeping up with documentation, people can spend more time solving issues and building new features. The incident management lifecycle is broken down into five steps – detection, response, remediation, analysis and readiness. No matter how your team, software or hardware is set up, every incident follows these same basic steps. But, as software development and IT operations have evolved, traditional service desks and ticketing systems are being overhauled by Agile and DevOps principles. Incident management of the future is defined by a DevOps mindset. Agile information management systems and open source tools have come up to improve collaboration across all of the software development, IT and business teams. Teams are constantly working to balance risk and security with service reliability and development speed. The more you can integrate reliability and security into development workflows, the faster you can deliver resilient applications and services. To effectively manage the incident lifecycle, your team needs to integrate IT monitoring and alerting, communication tools and detailed incident reports (aka post-incident reviews) into one centralized dashboard. This way, different people from different disciplines can access the same alert information and collaborate in case an incident is affecting multiple parts of the system. Powerful incident management software will create an end-to-end platform for major incident tracking and engagement – while remaining connected to your ticket management software. Let’s take a look at some specific functionality that’s required when implementing effective incident management software. DevOps and IT teams need to do their due diligence before buying or building an incident management solution. Map out how your incident management process will look, who’s taking on-call responsibilities, any SLAs/SLOs that need to be met and define actionable steps for achieving the desired results. Being notified of an issue is only helpful when useful information is attached to the alert. When monitoring and alerting becomes one integrated solution, on-call responders know exactly what to do. Incident management software like VictorOps offers a sophisticated rules engine, the Transmogrifier, which can transform alerts as they come into the centralized incident dashboard. This way, in-line with an alert, you can attach helpful wiki pages and runbooks, logs, charts, conference call links, etc. In real-time, on-call teams can quickly diagnose problems and find remediation instructions without escalating the issue. Don’t work for your incident management software, make it work for you. Adding context to monitoring and alerting operations will expose information from known unknowns and help on-call responders feel like they’re not alone in the dark. Incident management software needs to improve visibility into on-call workflows. Negative customer experiences result in losses to brand reputation, downtime costs and lost revenue. These major incidents should always be treated as emergencies – requiring on-call users to acknowledge incidents quickly and get teams working toward a resolution ASAP. With users, teams, rotations and on-call calendars built into your incident management software, you’ll ensure there’s never a gap in coverage. Users can easily see everyone’s on-call schedule and can even determine who’s on-call from other teams and rotations. Visibility and autonomy around on-call workflows offer flexible adjustments to on-call shifts and makes users feel like they’re somewhat in control of the on-call experience. Integrating on-call functions with alert context creates a holistic, actionable system for notifications – reducing alert fatigue while ensuring alerts never fall through the cracks. Without prioritization in alerting, incident management software can get cluttered quickly. Purpose-built incident management tools will leverage automation to easily surface critical incidents while creating less urgent notifications for minor issues. Also, the alert severity can be highly integrated with your collaboration and notification tools to ensure major incidents are pushed to the top of your queue. If you build your own incident management system, it’s very difficult to classify alert types and associate them with different notification policies, on-call calendars and the underlying monitoring tools without missing anything. Many times, so as not to miss any alerts, teams will simply send everything to email and spend hours navigating a sea of notifications. But, this creates a system where critical issues can be pushed down in your inbox – resulting in longer incident acknowledgment, response and resolution times. As your team becomes better at quickly surfacing the right issues to the right people, the way your team responds to the incident becomes the key. In our State of On-Call Report, we found that, on average, 73% of the incident lifecycle is spent in the response phase. So, creating real-time visibility into collaborative workflows and making incident navigation easy becomes essential to rapid incident resolution. Through a combination of manual and automated escalations, alongside intelligent routing keys, manual rerouting capabilities and ChatOps in incident response, users are empowered to quickly get an alert into the right person’s hands. Then, once the alert is in the right person’s hands, they’ll know exactly what to do with it. With a central timeline view in your incident management software, people can collaborate in real-time across multiple teams and multiple communication channels (SMS, email, Slack) to swarm onto an incident. With greater visibility into human workflows and how the system is operating, it’s easier for people to communicate around an incident and work collaboratively toward a resolution. Anything which improves the speed and transparency of communication will ultimately benefit any DevOps or IT team. As important as it is to have solutions for rapid, real-time incident response – if you’re only thinking about the response, you’re not addressing the entire incident lifecycle. Once the team has patched up an issue and found the resolution for the incident, the work isn’t quite over. DevOps and IT teams need to conduct thorough post-incident reviews and analyze incidents after-the-fact. When analyzing incidents and building a report, the team needs to think about the tools, processes and people that affected the incident’s outcome the most. What worked? What didn’t work? Then, the team can update runbooks, implement new systems, etc. – passing historical knowledge along through documentation and always becoming more prepared for future issues. Most traditional IT service management (ITSM) practices rely on the underlying IT Infrastructure Library (ITIL) framework. And while many monitoring and alerting principles apply to both traditional ITSM-structured organizations and DevOps-centric businesses, their incident management software requires a slightly different approach. The old way of operating involved software developers writing code and throwing it over the fence where IT operations teams would configure it, deploy it and maintain it. But, this model is simply unsustainable in a world run by CI/CD, rapid deployments and complex interconnected systems. A DevOps-focused organization can bring IT and developers closer together and allows for faster changes while bringing greater resilience to the software development process. Then, developers have more exposure to how their code works in production and IT better understands staging environments and the overall development lifecycle. Comprehensive incident management software can help centralize your software delivery tools alongside infrastructure and application monitoring software. And, with the addition of essential collaboration functionality (i.e. chat, tagging, mobile applications, etc.) your entire team can manage workflows from the beginning of software development all the way to deployment. In our most recent eBook, Why DevOps Matters, we go even deeper into why collaboration and workflow transparency are essential for an effective DevOps team. But, incident management software can drive efficiency for any team – no matter how you’ve structured your IT and software development teams. A well-built team is the most important part of maintaining the reliability of agile release cadences – but incident management software is a close second. Being able to quickly diagnose an incident, collaboratively respond to problems in real-time and leverage your learnings to continuously add resilience to your applications and infrastructure isn’t something every team can do. Differentiate yourself not only through the speed at which you can deliver services but by the quality at which you maintain those same services. 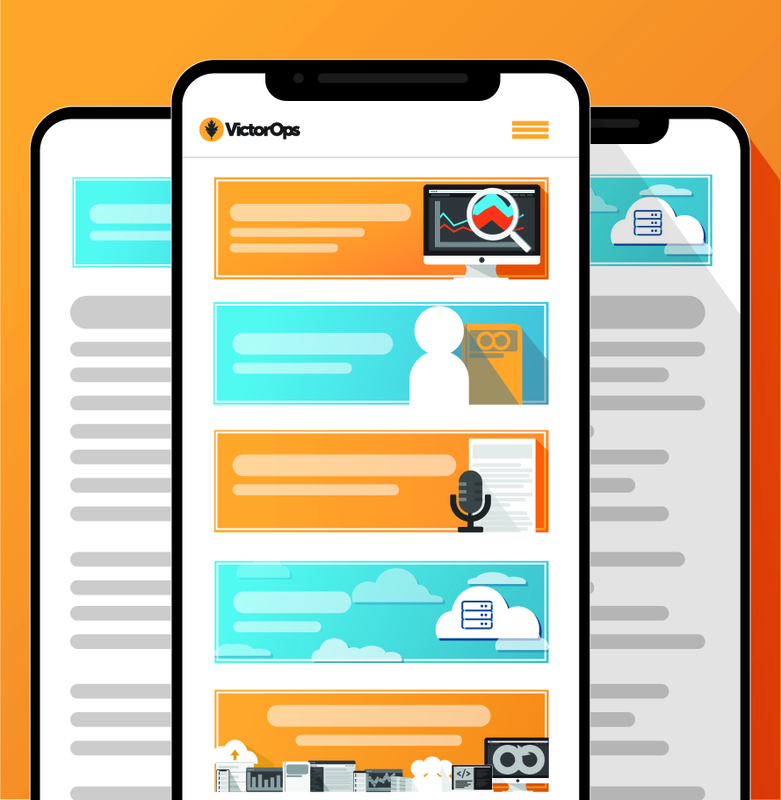 Sign up for a 14-day free trial or register for a personalized demo to see why VictorOps is the only incident management software truly focused on improving service reliability through collaborative, transparent on-call workflows.